Below are the most frequently asked questions about Xylosynth™ and our other Wernick products and accessories. Just click on a question to view the answers. If your question isn’t answered here, you can always get in touch. Each key is individual and can be sent back for repair so if you have time to send the key for repair (we can repair and dispatch same day) then this is the cheapest option. If people are depending on you then a spare key might be good just in case. Although if time is tight you can always move a less used key into position. The keys are very robust so this may never be an issue. However, all parts and labour are guaranteed for 2 years including keys. We try to dispatch within 4 weeks of date of order. Transit time varies according to where you are in the world, from next day (UK) up to 5 days. We always try to do our best! We require payment before your order is dispatched. The usual method is bank transfer. We use the foreign exchange specialist Smart Currency so you can normally pay into an account in your own currency. Your payment takes about a week to come through to us so it is a good idea to pay at least a week before your estimated dispatch date. We also accept cheques but they take longer to clear. The sustain pedal is just a ‘normally open’ pedal. When depressed the notes sustain, when the pedal is released the notes stop sustaining. 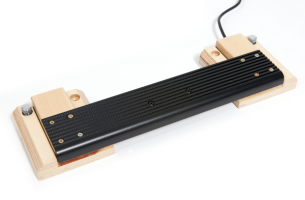 Our sustain pedal is very good quality, 14″ long and easy to find on the floor. However, you don’t have to buy our pedals, any ‘normally open’ pedal will work with the Xylosynth. The standard Xylosynth has no internal sounds. There is a ‘midi out’ socket for you to access sounds from most devices with a ‘midi in’ such as a sound module. The new Mk7 has USB communication for easy connection to laptop/device based sounds. We can add our internal sounds if you want. They are of average quality but inexpensive and very easy to start with and they do not stop you from accessing external sounds at any time. The solid hardwood Bubinga keys are similar in appearance to traditional Rosewood. Slightly denser than the Birch they have a certain ‘gravitas’ when struck, although the difference is slight. Like any solid wood keys they should not be left next to radiators or left out to suffer large changes in temperature or humidity. Cover at night if left in large auditoria or theatres. The Birch/Stained Birch keys are a laminated hardwood and slightly more sensitive when struck although the difference is slight. The Birch keys are easier to make and are accordingly less expensive. They are polyeurathane coated and not so temperature and humidity sensitive so you can rest easy about day to day care. The Stained birch are a less expensive option for a traditional look.